Spain: The Road to the “New World”. Iberian Peninsula Spain is on the Iberian Peninsula. A peninsula is a land mass that has three of its borders touching. 2 Iberian Peninsula Spain is on the Iberian Peninsula. 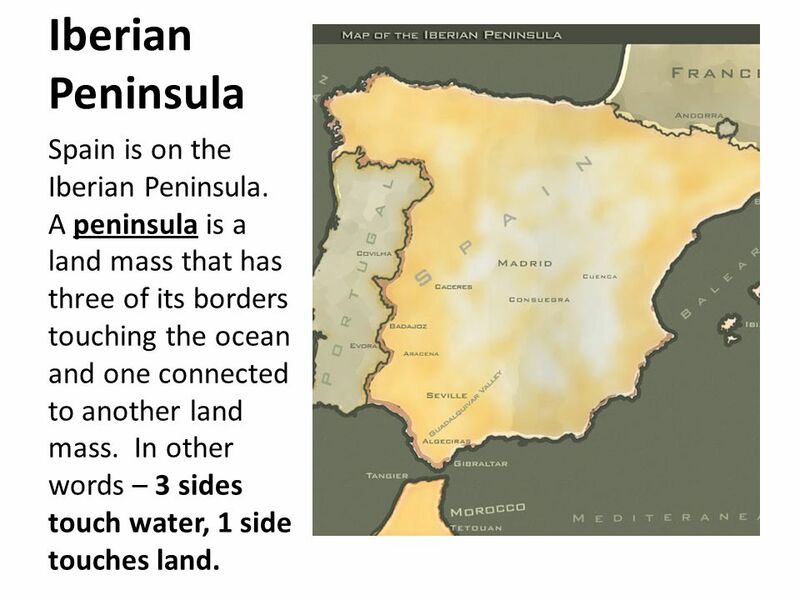 A peninsula is a land mass that has three of its borders touching the ocean and one connected to another land mass. In other words – 3 sides touch water, 1 side touches land. 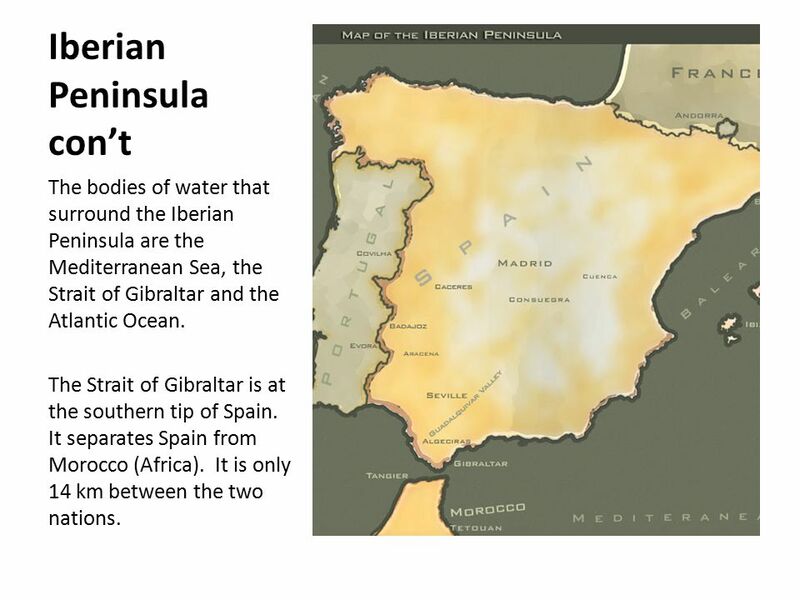 3 Iberian Peninsula con’t The bodies of water that surround the Iberian Peninsula are the Mediterranean Sea, the Strait of Gibraltar and the Atlantic Ocean. The Strait of Gibraltar is at the southern tip of Spain. It separates Spain from Morocco (Africa). It is only 14 km between the two nations. 4 Geography The Pyrenees are the largest mountain range in Spain. They separate Spain from France. Thanks to these mountains Spain was very hard to conquer, from Europe, in the Middle Ages. They allowed the Muslim Empire to come from north Africa, conquer, settle and spread their ideas and culture to the region. The climate of Spain is generally rainy in the north; the winters are mild and the summers cool. The southern two- thirds of the country is dry, hot with very little rainfall. Summer temps. Often reach 50 degrees Celsius. 6 Who were the Moors? The Moors were Muslims who lived in the northern African countries of Morocco and Algeria. They called the land of the Iberian Peninsula "Al-Andalus". The Moors Invade Europe In 711 the Moors crossed the Mediterranean Sea from North Africa and invaded the Iberian Peninsula. Over the next seven years they advanced into Europe and controlled the majority of the peninsula. They brought many technologies, ideas etc. that made Spain more advanced than many European nations at this time. 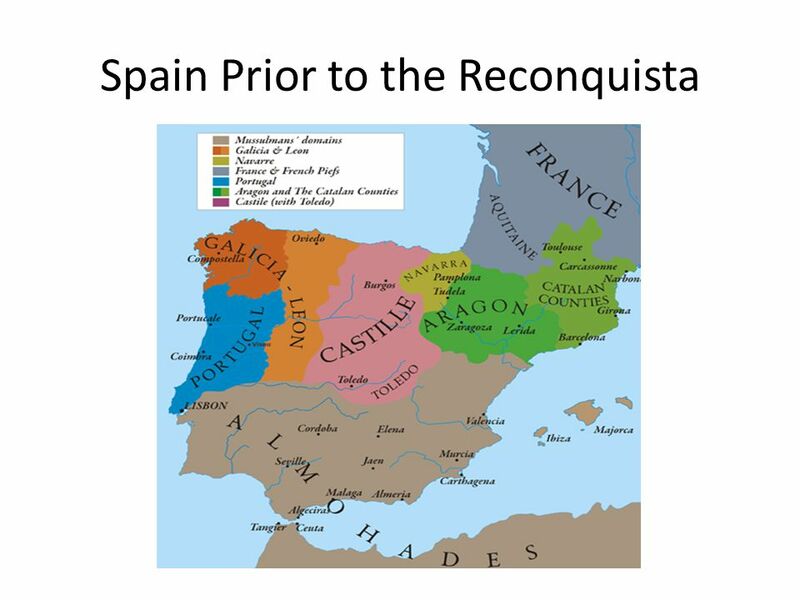 Catholics Unite – Reconquista (Re-conquest) The Catholic kingdoms of northern Spain started to become more powerful during the Renaissance years. They began to unite and decided that they wanted one nation that was to be completely Catholic (Christian). The people of the north shared religious views, language, currency and beliefs. They now had a national identity (a group of people, mainly of common descent, history, language etc. often forming a state or inhabiting a territory). This was not good news for the Jews and Muslims living in Spain at the time. In 1479, the kingdoms of Aragon and Castile united with the marriage of Isabella (Castile) and Ferdinand (Aragon). The new monarchs were now very powerful and continued the Reconquista until the Muslims were completely expelled from Spain in 1492. 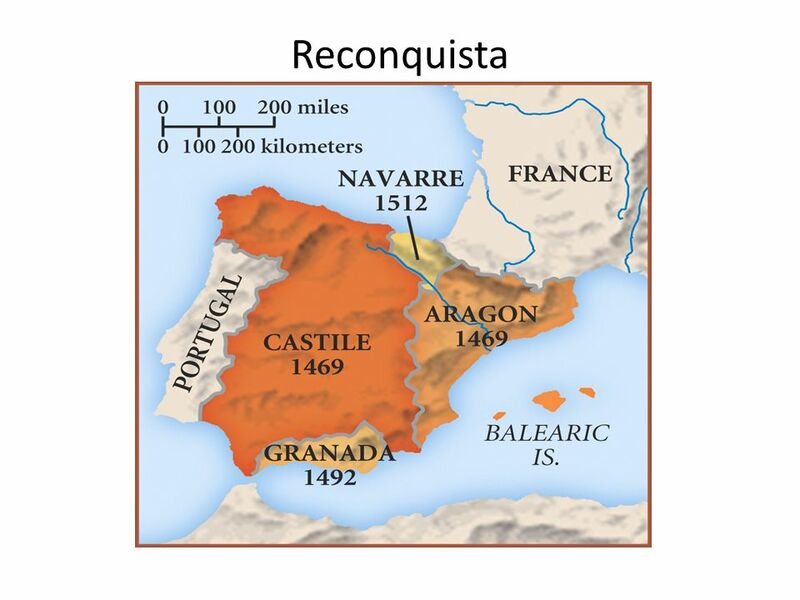 8 Spain After 1492 In 1492, the Catholic kingdoms of Aragon and Castile had achieved their goal. 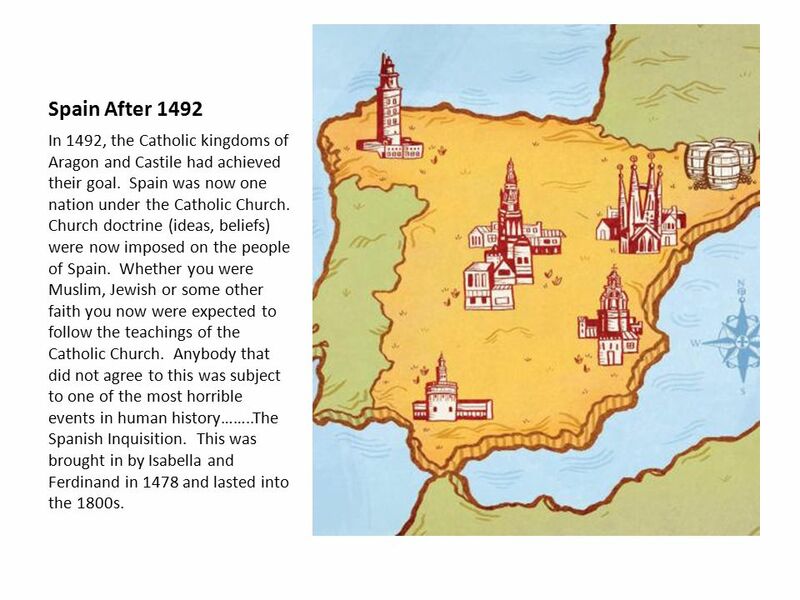 Spain was now one nation under the Catholic Church. Church doctrine (ideas, beliefs) were now imposed on the people of Spain. Whether you were Muslim, Jewish or some other faith you now were expected to follow the teachings of the Catholic Church. Anybody that did not agree to this was subject to one of the most horrible events in human history……..The Spanish Inquisition. This was brought in by Isabella and Ferdinand in 1478 and lasted into the 1800s. 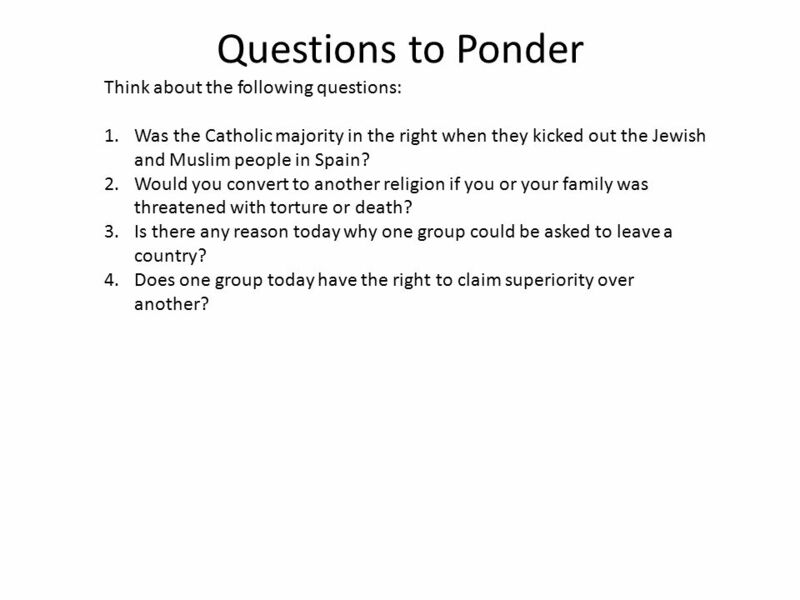 9 Questions to Ponder Think about the following questions: 1.Was the Catholic majority in the right when they kicked out the Jewish and Muslim people in Spain? 2.Would you convert to another religion if you or your family was threatened with torture or death? 3.Is there any reason today why one group could be asked to leave a country? 4.Does one group today have the right to claim superiority over another? 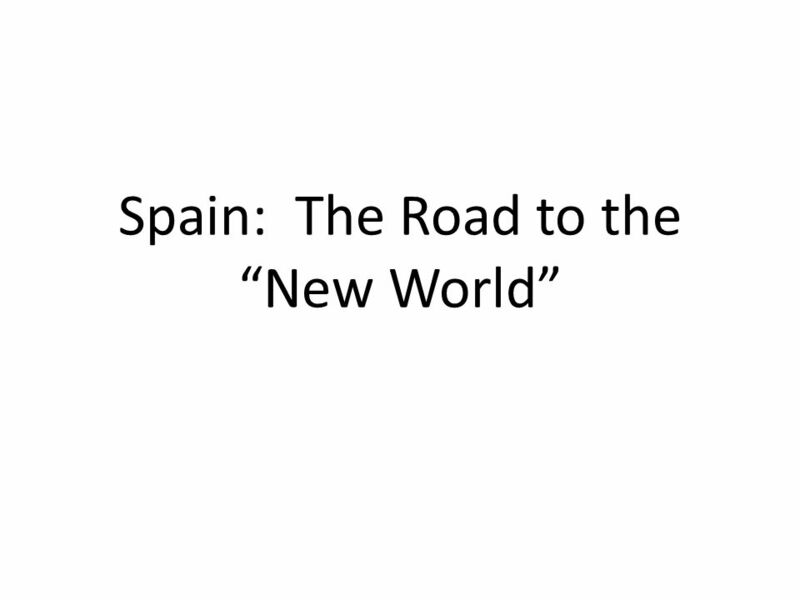 Download ppt "Spain: The Road to the “New World”. Iberian Peninsula Spain is on the Iberian Peninsula. A peninsula is a land mass that has three of its borders touching." 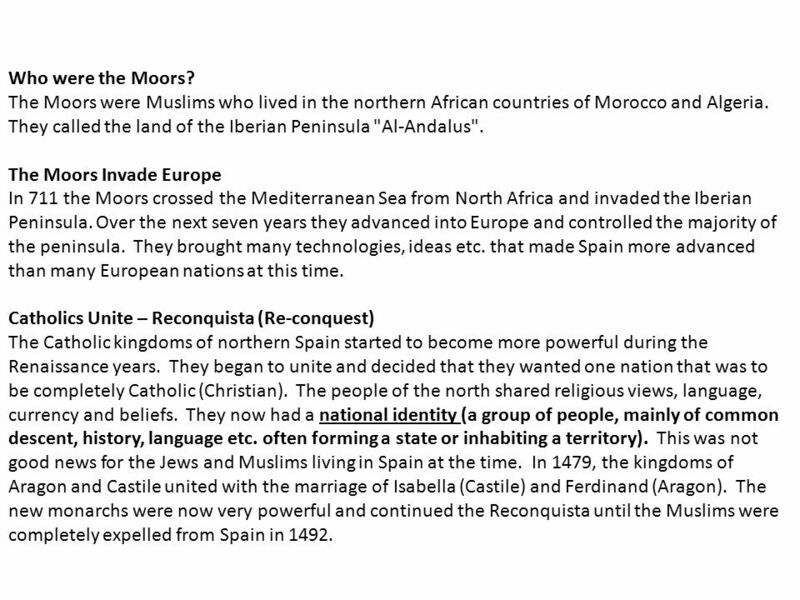 Do Now Share your timeline answers (page 34) Record at least three effects of the Reconquista with your table (use the book and you prior knowledge). Make. Iberia Spain, Portugal, Andorra, and Gibraltar. Terms and Places Basques are a minority that is unrelated to any other European ethnic group. Gibraltar. Muslims controlled most of the Iberian Peninsula. The Muslim culture flourished as Muslims and Jewish scholars work together to make great strides in learning. Geography of Europe. Can you name this country? 8 United Kingdom. Goal: Why did Ferdinand and Isabella adopt the policy to expel Jews and Moors from the Iberian Peninsula? Motivation: Under the Ottoman Empire how was. 1200s-1400s Spain.  By 1100s, some started questioning the church  Heresy: religious ideas that oppose accepted church teachings (Heretics)  In the. Islam in Africa Islam is the most common religion in Africa. 45% of all Africans practice Islam. 89% of people in North Africa are Muslim. Where in the World?! Southern EUROPE Nov 30th - Dec 4th. The Spread of Islam Madnick Global History 9. Following the death of Mohamed (632) Islam spread rapidly through Afro Eurasia In one century, Islam spread. North Africa Moroccan Camel Caravan. Regions Of Africa.